Amethyst GRAPE & CABLE Berry Set. Grape and Cable Master Berry Bowl in Blue. Grape and Cable Master Berry Bowl in Marigold. 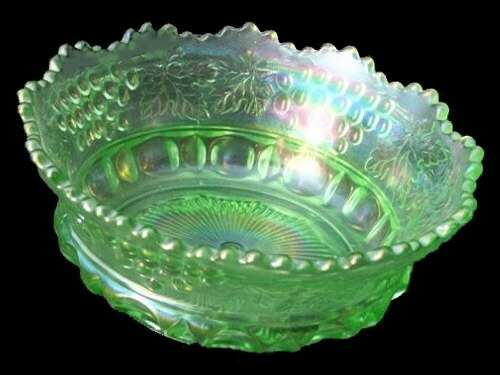 Grape and Cable Master Berry Bowl in RARE Ice Green. 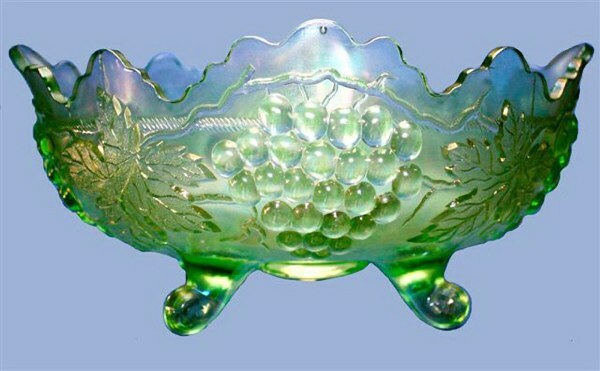 BERRY BOWLS: The Fall 1910 Butler Brothers catalog displayed the 2 pc. Berry set, along with the table and water set, calling this the “Vineland” Dining Set Asst. (Iridescent). Two versions were marketed: one thumbprint, the other ruffled. 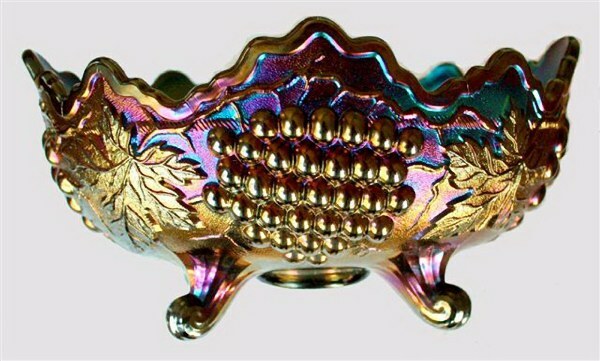 Large raised thumbprints encircling the lower portion, with pattern on the exterior surface, separates the “thumbprint” design from the “ruffled” type. The large bowl measures 10” – 10 ½”; the small bowl 5”- 6”. Found most often in amethyst and marigold. Green and cobalt blue are very scarce. Pearlized custard is rare and ice green is very rare! Pattern is on the interior of the ruffled version. Shaped from the same mould used for the ice cream set, there are no thumbprints. These have the Basketweave exterior . The large bowl measures 11’-12”; the small bowl, 5”-6”. Amethyst and marigold are seen more often than green. Cobalt blue is scarce, with white, ice blue and ice green being rare. GRAPE and CABLE Banana Boat - ice green. GRAPE and CABLE Amethyst Banded - Stippled Banana Boat. Grape and Cable Blue Banded - Stippled Banana Boat. BANANA BOWLS: These oval shaped footed bowls may be stippled, sometimes called “banded”. Measuring 12”- 13” in length, they are never trademarked. Amethyst, marigold, and green, in that order, are most available. Scarce in white, ice blue ice green, and pearlized custard. Cobalt blue examples are rarely found. Stippled/banded versions are much harder to locate. 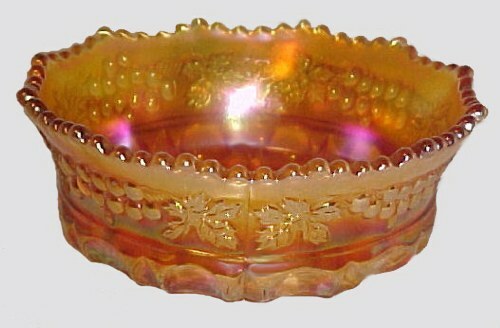 The raised band is about ½” wide, running around the top portion of the bowl. Marigold, green, cobalt blue, Renninger blue and aqua are the colors to look for. GRAPE and CABLE Cracker Jar - Amethyst. 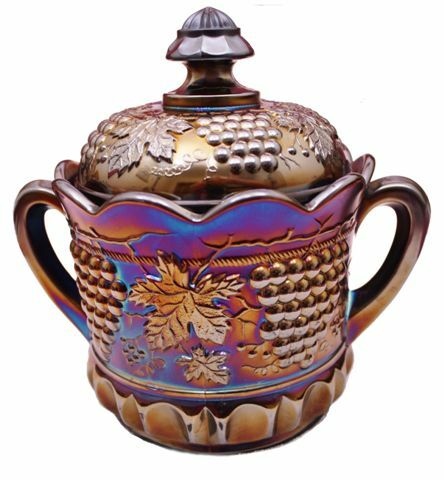 CRACKER JAR: This two-handled covered jar turns up more frequently in marigold and amethyst than the more rare colors of cobalt blue, white, smoke, ice green, or the extremely rare aqua opal, but Jerry Curtis was quite surprised to “find” this amethyst example reasonably priced and just waiting to be picked up! GRAPE and CABLE, Large footed. 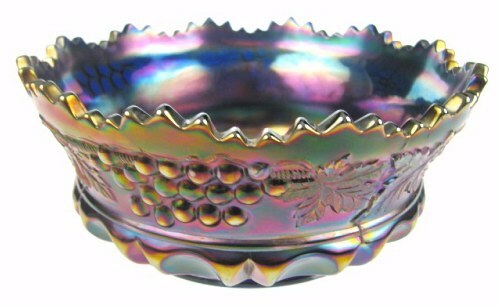 Fruit Bowl, BANDED - Purple-QUITE RARE! 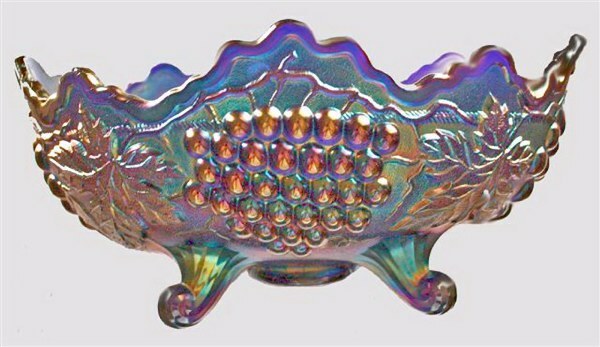 Amethyst Grape and Cable Large-size Fruit Bowl. 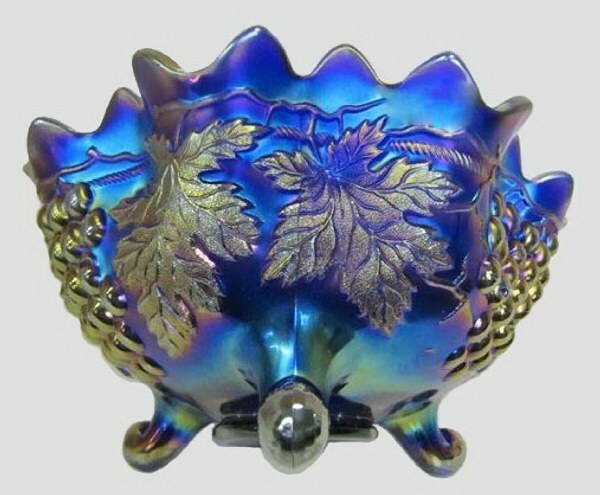 GRAPE and CABLE Large Fruit Bowl - Electric Blue. 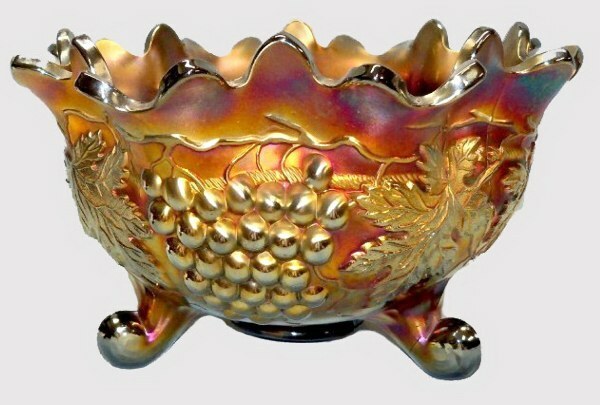 FRUIT BOWLS: These large, footed and banded deep variations have a raised, ½” wide band around the top edge. Virtually never seen and reported in amethyst, marigold and cobalt blue. Large, footed, and deep bowls, referred to as “orange bowls” are harder to find than the more shallow types. These stand 6” -7” high. Known colors: marigold, amethyst, green, cobalt blue, white, russet (olive), and ice green. GRAPE and CABLE Spittoons - from Powder Jar base - Marigold and Amethyst. 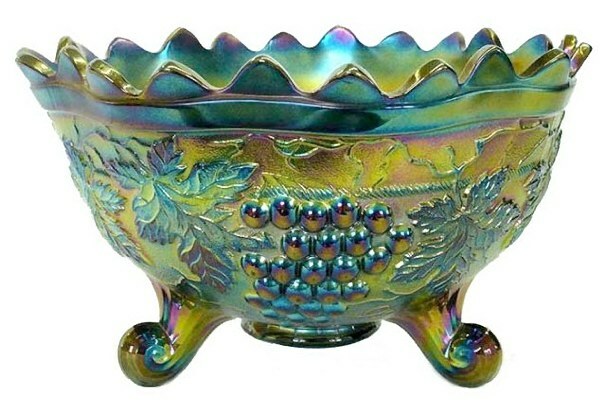 SPITTOON Whimsey: “Fashioned” (re-shaped) from the powder jar base; known in marigold, amethyst and green. (Another term: “Money-making gimmickry”). Finally, all of you be of one mind, having compassion for one another; love as brothers, be tenderhearted, be courteous; not returning evil for evil or reviling for reviling, but on the contrary blessing,knowing that you were called to this, that you may inherit a blessing. For “He who would love life and see good days, let him refrain his tongue from evil, and his lips from speaking deceit. But even if you should suffer for righteousness’ sake, you are blessed.